Join our Discord if you're looking for players! 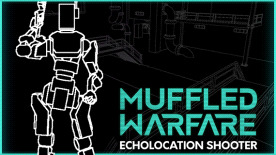 From the creators of Stifled comes Muffled Warfare, a brave new entry into the echolocation-game genre. ECHOLOCATION - Use sound to SEE, SHOOT and SILENCE the competition. STEALTH MECHANICS - Fade into the darkness that is silence. MULTIPLAYER MAYHEM - Silence or be Silenced? FAST-PACED ACTION - There was too much walking in Stifled. E-SPORTS - We were told this drives traffic and draws investments. OUTLANDISH WEAPONS - Because regular weapons are, meh. 4K HDR GRAPHICS - Gotta get in on them buzzwords. COLORS - Like, 4 of them.